SilentWings 3 | be quiet! Designed for powerful water- and air-cooled systems, the Silent Wings 3 120mm PWM Fan from be quiet! uses funnel-shaped inlets to deliver efficient air circulation and high air pressure. 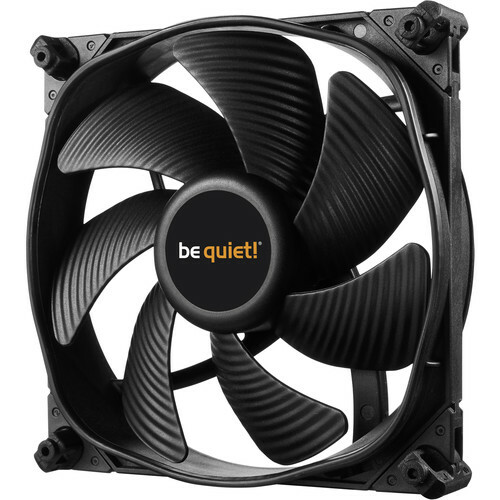 It uses seven airflow- and surface-optimized fan blades and a maximum fan speed of 1450 rpm to bring quiet cooling to your rig, and thanks to Pulse-Width Modulation (PWM), all compatible 4-pin controllers can intelligently vary the speed of the fan. Living up to its name, this be quiet! product generates only 16.4 dBA of noise, even when operating at maximum speed. This fan is also equipped with Fluid Dynamic Bearing technology, which helps to provide a reliable and long operational life of up to 300,000 hours. Included are five screws, five push pins, five silica gel washers, and rubber & hard plastic mountings. Protection is provided by a limited 3-year warranty. A six-pole fan motor with three phases for low power consumption and reduced vibration produces maximum noise levels of 16.4 dBA. A high-quality IC motor controller helps reduce electrical noise. Pulse-Width Modulation (PWM) allows all compatible 4-pin controllers, including those built into many motherboards, to intelligently vary the speed of the fan. Seven fan blades with an optimized surface structure help to ensure virtually inaudible operations and a strong airflow. Removable anti-vibration mountings on all four edges of the fan help to reduce vibrations transmitted to the system case. The rubberized fan frame is equipped with funnel-shaped air inlets for efficient air circulation and high air pressure, which makes the fan a solid choice for use in gaming and multimedia PCs, overclocked systems, and for use with radiators. The fluid dynamic bearing (FDB) enables a long fan life of up to 300,000 hours, or around 34 years, plus reduced operating noise. Box Dimensions (LxWxH) 7.6 x 5.6 x 1.4"